The directions below show alternatives to the routes proposed by satellite navigation systems, so that you can choose the best way to reach Camping Cala Ginepro. Approximate duration and distance of the route: around 15 minutes, 12 km. Follow the signs for Olbia - Sos Alinos. Cross the bridge at the Orosei exit and, after around 11 km, turn right and follow the signs for Camping Cala Ginepro. Continue on Viale Cala Ginepro and…welcome to Camping Cala Ginepro! Approximate duration and distance of the route: around 1 hour and 10 minutes, 85 km. Follow the signs for Nuoro/Cagliari. Join the road signposted as “SS131 Carlo Felice DCN” and continue for around 50 km. If you prefer to avoid the centre, skip the first exit for Siniscola. After the tunnel, take the exit for Siniscola and immediately follow the signs for Orosei. Follow the provincial road for a few kilometres. Turn right and head for Orosei, joining the “Orientale Sarda” (Eastern Sardinia) road, signposted as “SS125”. Continue along the Orientale Sarda for around 20 km, until you see the signs for Camping Cala Ginepro. Approximate duration and distance of the route: around 1 hour and 20 minutes, 93 km. From the port, head towards Via Marconi. Continue along the provincial road and the western bypass for around 15 km. Take the road signposted as “SS131 Carlo Felice”, then follow the signs for Cagliari/Nuoro. Continue on the SS131 for around 50 km. Approximate duration and distance of the route: around 2 hours and 20 minutes, 192 km. Follow the signs for Nuoro /Cagliari and join the road signposted as “SS131 Carlo Felice”. Continue on the SS131 for around 110 km. Shortly after the Nuraghe Losa archaeological area (you will see it signposted on your right), take the exit on the right for Nuoro and join the road signposted as ”SS131 Carlo Felice DCN”. Follow the SS131 Carlo Felice DCN and continue towards Olbia (skip the exit for Nuoro). After around 27 km, take the exit on your right for Dorgali/Orosei. Immediately follow the signs for Orosei and then for Galtellì. From Galtellì, continue towards Orosei. At the entrance to Orosei, drive past the church called the “Chiesa del Rimedio” and on the right take Via San Francesco, heading towards Olbia. When you reach the STOP sign, take a right onto Via Verdi. 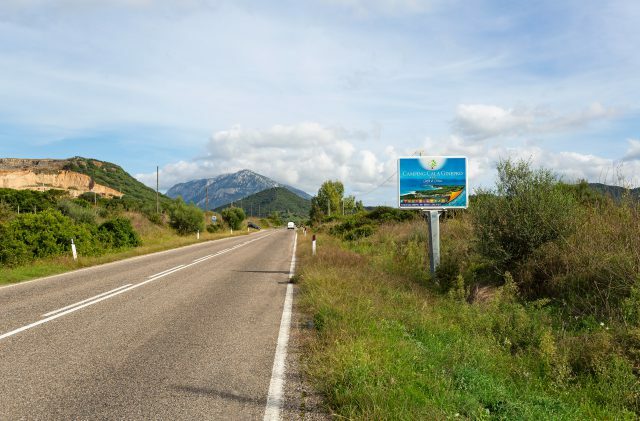 Continue until the end of the road and take a left, heading towards Olbia – Sos Alinos. Approximate duration and distance of the route: around 2 hours and 30 minutes, 197 km. Follow the signs for Sassari, and take the road signposted as “SS291 della Nurra”. Join the 4-lane “SS291var della Nurra” highway, heading towards Sassari. Continue for around 8 km on the 4-land highway, then take the exit on the right for Cagliari. Join the road marked as “SS131 Carlo Felice” and continue for around 90 km (especially if you are travelling by camper van or caravan, we recommend that you take this route to avoid the exit for Nuoro near Birori: that route is shorter by 20 km but it is a two-way road with a great many bends). Approximate duration and distance of the route: around 2 hours, 168 km. Follow the signs for the road marked as “SS131Carlo Felice”, heading towards Nuoro/Cagliari (avoid the route that takes you through Scala di Giocca, which has many sharp bends). Approximate duration and distance of the route: around 2 hours and 40 minutes, 230 km. Follow the signs for Sassari/Olbia/Nuoro/Oristano and take the road signposted as ”SS131 Carlo Felice”. Follow the SS131 for around 120 km. Take the exit for Nuoro and continue along the SS131 Carlo Felice DCN for around 70 km, continuing towards Olbia (skip the other exits for Nuoro). Take the exit for Dorgali/Orosei. Approximate duration and distance of the route: around 1 hour and 45 minutes, 138 km. Follow the signs for the road marked as “SS131 Carlo Felice”, heading towards Nuoro. Take the exit for Nuoro (after around 30 km) and continue on the road marked as “SS131 Carlo Felice DCN” for around 90 km, heading towards Olbia (skip the other exits for Nuoro). Approximate duration and distance of the route: around 1 hour, 55 km. From the exit for Nuoro, on Via Mannironi, head for the road marked as “SS131 Carlo Felice”. Follow the signs for Olbia and join the road marked as “SS131 Carlo Felice Diramazione Centrale Nuorese”. After around 20 km, take the exit on your right for Dorgali/Orosei. Approximate duration and distance of the route: around 2 hours, 138 km. Follow the signs for Nuoro for around 30 km, until you join the road marked as “SS 389var” of Buddusò and Correboi. Continue for 52 km, then take the exit for Olbia and join the road marked as “SS131 Carlo Felice DCN”. Follow the signs for Olbia and join the road “SS131 Carlo Felice DCN”. If you reach Sardinia by air and you don’t opt to hire a car from the airport, in the dedicated section you will find useful advice on how to reach Cala Ginepro.